The days are longer and the sun is shining. It’s time to think about a summer vegetable garden and what to plant. So what grows best here in the Pacific Northwest? Well, now is the time to plant those pole beans. Have you ever made a pole bean tee pee? It’s a great way to keep the growing beans contained. Be sure to plant in full sun for optimal harvesting and pick them when they are small and tender! And if you have some picky kiddos then try planting bushing “purple beans” that magically turn green when you cook them – that’s pretty fun! Learn to make a great pole bean tent and more from Garden Therapy! Next on my best of list is zucchini – it’s easy to grow! My mom used to make these tasty little zucchini cakes topped with a fresh tomato sauce and a dollop of sour cream. Or these days try it with Greek yogurt. Have you ever had a Chocolate Zucchini Cake? I’ve got a recipe for you! Next on the must to-plant list are sweet 100 tomatoes – this variety loves our NW weather. And there is nothing like going out to the garden and popping them right of the vine into your mouth. I also love them skewered, rubbed with olive oil, seasoned and then grilled till lightly charred and served as a side dish or served atop a grilled steak. My last bit of advice is to be sure plant to a few greens. Arugula is a great addition to any garden. And rainbow chard, in hues of pink, yellow, red and white will grow bountifully, keep trimming it to the base and it grows all season! In a mixer cream together the butter, oil and sugars. Beat in the eggs, vanilla and buttermilk. Sift together the dry ingredients. Mix into the creamed ingredients a little at a time until incorporated. Stir in the walnuts, zucchini and chocolate chips. Butter and flour a large (10-cup) Bundt pan and pour in batter. Bake for approximately 1 hour and 15 minutes or until a toothpick inserted in cake comes out clean. Let cake stand in pan for 5 minutes or so then remove from pan and place cake on a rack to cool completely. To make the glaze: In a small pan heat the chocolate, cream and coffee over low heat till smooth and just melted. Pour over cake. Let set 15 minutes before serving. Everyone loves a great margarita! It’s been popular in the U.S. since the early 50’s, and there are a lot of opinions on what makes a great margarita. A classic ‘rita is typically made with tequila, fresh lime, a touch of simple syrup or agave nectar, and triple sec or orange liqueur. Let’s review our options. • Silver is ideal for a fresh, bright margarita or made with fresh fruits. • Reposado is aged a minimum of 2 months – 12 months in wooden casks. This light aging process rounds out a few of the rough edges found in many unaged tequilas. • Añejo is aged more than 1 year and wonderfully smooth. It’s best for sipping on their own, but use it in a margarita if you like or add it as a float for depth of flavor. 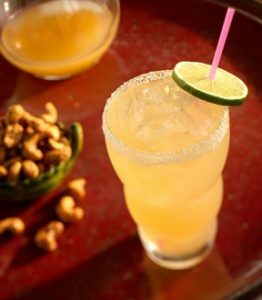 Margarita MUSTS include starting with a good tequila, using FRESH SQUEEZED lime juice, orange liqueur (triple sec, Grand Marnier, or Cointreau) or a squeeze of orange works great too. Now sweeten to taste with a touch simple syrup or agave nectar. Some like salt rims; some do not. I’m 50/50 and like a half rim of salt (my preference being kosher). Or there are tasty salt rimmers:check out my video for Sweet Citrus Salt. And of course, there are the “add-ins,” a splash of cranberry juice, pomegranate, fresh berries … the possibilities are endless! Build drink in a cocktail shaker. Fill with ice, cap and shake. Pour into a glass, garnish with a lime wheel, and enjoy! I love adding a touch of zing to dishes, punching up the flavor. Like a squeeze of lime, and a sprinkling of cumin and chili flakes on grilled fish or a fresh zesting of lemon over steamed asparagus. Now you probably have your own favorite seasoning or rub, or maybe you’re a big fan of just lots of garlic and some fabulous sea salt. A great signature seasoning is easy to make. Start with some kosher salt, then add in some granulated garlic and onion – this is your base. Then add in some of your favorite spices, like chili powder and cumin for something Latin-inspired. Or go Mediterranean with dried thyme, smoked paprika and toasted fennel seeds. To make a Citrus Infused Salt: zest an orange, lemon, and lime. Mix with a cup of kosher salt then toss well. Spread on a sheet pan to dry out for a couple of days. Once all the moisture is gone, then rub it together with your fingers to break up the zest. Use this sassy salt over EVERYTHING! My newest favorite seasoning combo and add-ins are coffee and cocoa nibs. Yes, it’s a bit unconventional, but oh so amazing! 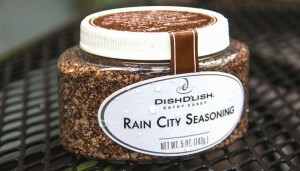 I’ve included it in my newest seasoning blend, my Dish D’Lish Rain City Seasoning. In this new seasoning, we are mixing it up with Caffe Umbria Coffee and ground Theo Chocolate fair trade cocoa nibs, along with some sea salt, citrus and spice. D’lish on northwest salmon, a big juice steak, or on Savory Roasted Squash.